Mel's recent posts about productivity and checklists made me think about the collection of tools I've been trying out. I say "wasting" instead of "saving" time because these can be procrastination devices par excellence, but they do help you to get work done if used in the proper spirit. From a blog post some months ago (sorry--can't remember where) I collected an Excel template called the "Writing Marathon Template": http://www.zokutou.co.uk/tools/. It's satisfying to see the word count mount up, and the template scolds you ("you'll never finish at this rate!") if you don't meet your goal. PowerProf suggested the Egg Timer some months back, and it's great. Setting the timer for a specified time helps with the "getting started" process of writing. There's a free version, but the $5 spent is well worth it. Clockworktimer.com is an online timer that helps you to track your productive (and not-so-productive) activities. There are probably lots more online toys for these purposes, but lifehacker.com just had a post about one that I've used for a long time: a paper appointment book divided into 15-minute segments for tracking what you're doing. Another paper favorite: the trusty old steno notebook, with each page divided into 4 quadrants: Write, Read, Respond, and Do. Of course, the irony is that when the writing is going really well, these are all superfluous because you lose all track of time and just want to keep going. One of my greatest dissatisfactions with academe is the kind of underlying encouragement to see the job as a calling, to see one's commitment to a job as a "marriage" or becoming part of a "family," because I think this is part of the way that academe abuses its practitioners. Like liz ferszt in the comments section at Dr. Crazy's, I've seen this from both sides; there's no question that having a faculty member come in for a year and then leave is disruptive, especially if the department is small, the budget is tight, and the powers that be would rather fund yet another Assistant to the Associate Sub-Head in Charge of Administrivia than shell out for a faculty line to replace the departing person. The fear of having junior faculty move eventually even causes some haunting fears at hiring time: "If we hire so and so, will she stay?" This can't, and doesn't, enter into the decision-making process, but it's not an unrealistic idea. That said, I'd side with the junior faculty on this one. Although we'd like to deny it, working at a university is like a marriage, albeit an old-fashioned and unequal one with all sorts of sexist overtones. We (academics) are the dewy, eager prospective brides who want the institution to "marry" us by offering a tenure-track position. We don't want to be the ones good enough to teach courses for a university but not good enough to hire when a t-t position comes available. Even as t-t faculty, all the power is implicitly on one side: "We chose you out of hundreds of applicants. If you behave yourself, publish like mad, and seem grateful enough, at the end of six years we may make this marriage permanent--unless, of course, we decide we'd like someone newer and more exciting." It seems to me that the increasing trend for junior t-t faculty to explore their options on the job market is just an attempt to even up this power differential. I don't think that institutions mean to abuse this power. Departments hire candidates because they want to see them stay, of course. But whatever it may promise in the courtship process (and there's that metaphor again), however much it might want to behave ethically and in the best interests of the faculty member, an institution will always place its own interests first. Always. That's the nature of an institution. A faculty member who forgets this, who places the institution's interests ahead of her own or at least refuses to acknowledge that the two are different, does so at her peril. But being here also means kayaking on the lake and walking the back roads and watching foxes run across the road and seeing family--all worth doing, especially since the trip will be over soon. Some like it hot . . .
but it sounds as though most of us would appreciate a break from the heat. * It's nice being a visitor in this place where I can't walk down a road without running into one or another of my cousins. It feels a little strange, though, to go to a town 30 miles away and still run into cousins, friends, or friends of friends. This is an advantage now. It was not an advantage when I was trying certain mild (not wild) feats of daring in high school. 1. Grammatical pet peeve: random apostrophes on signs. Or should I say "random apostrophe's on sign's"? Actually, roadside signs are pretty entertaining. For example, some years back while driving on back roads in Vermont, we went by a small house with at least an acre of painted cement lawn elves, rabbits, turtles, toads, deer, and other assorted fauna along with the requisite plywood cutouts--silhouettes of deer, men leaning on posts smoking pipes, and the ever-popular backside-of-large-woman-in-print-dress. The sign read "lawn cutie's for sale," and ever after lawn decorations have been known in my family as "lawn cuties." 2. Arts and entertainment pet peeve: Probably the same as most women's--the conspiracy to pretend that women are naturally a size 2--and that the ample breast size of those size 2 movie stars is natural and never enhanced by the surgeon's art. 3. Wild card: People who ask a question and don't listen to the answer. My secret strategy for dealing with people like this (once I know who they are) is to answer the question with a question about themselves, which was the point of their question to begin with. 1. People here understand that the sign I read as "speed limit" really means "suggested speed for people not living in Big Eastern City." They know it means 80 when the sign says 55. This is why they are more efficient than I am. 3. I read blog posts in which people talk about working in coffee shops, but give me a library every time. After I finished my work at the research library, I went to the main library at Not My Campus and stayed until they turned off the lights. I'd have stayed longer if they would have let me, but that was obviously out of the question. 4. It's nice hanging out with family by the lake, but it would be even nicer if finding time to write a promised piece wasn't such a challenge. 1. Staying up until 4 hours before the rest of the house awakens (at the crack of dawn, always, always). 2. Cruising the internets, reading the New York Times and catching up on blog reading. 3. Resenting the fact that I just got back from a conference and tomorrow have to leave on a research trip, however productive that might be. 4. Watching an obscure movie. 5. Not working on impending article promised long ago for a far-too-soon deadline. * scanned a whole lot of microfilm to .pdf and burned it to a CD at the library. * turned in an overdue book order. But I can hear Boice, David Allen, and the rest of the efficiency crew hanging their virtual heads in shame at my defection. Another view. 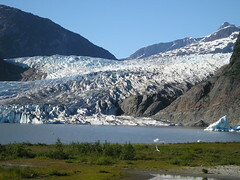 It, like all the glaciers in Alaska and elsewhere, has been receding. The presentation went very well, and after? 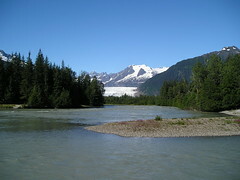 Walk the trails near the glacier in Juneau.